Literally a tapestry on the wall, a world was created within it by Masakazu, to escape the horrors he'd faced in reality. Because creating a world and then life within it is a taboo act, the tapestry became his prison, and would blink in and out of random moments in time. Others could come and go freely if they knew how, and Masakazu could pull things in yet not leave. The 'health' of the tapestry in reality is based entirely off of Masakazu's life. Kaaten is an entire country within the tapestry, and is inhabited by golems, or homunculi that Masakazu created using inanimate objects as catalysts. The inhabitants are ignorant of the truth behind their lives, or that their world isn't real. Kaaten literally means "curtain" in Japanese. Kaaten's setting is a fantastical version of ancient Japan. All of the inhabitants look primarily Japanese. The spoken language of the world is a form of Japanese. Kaaten uses beads as currency. 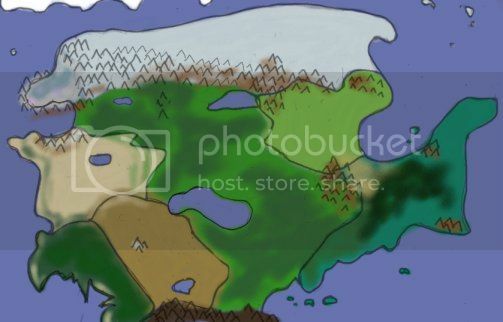 The first country of the 'real' World Outside that we are introduced to, located on the northeastern side of the Northern Continent. 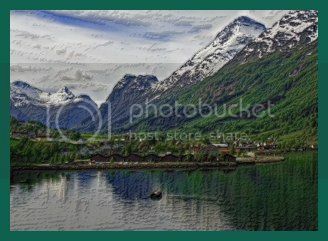 Its landscape is fertile, and reminiscent of Norway in our world. Because of it's proximity to the Frozen North, Hivae is chilly most of the year, but not frigid. It is protected by mountains on three sides of the country, and the land itself is slightly below sea level the farther inland you travel, giving it a pleasant climate year-round. Like every other country on the Northern Continent, it experiences the Season of Death Mist (or Season of Fog for some locales) in place of snowy winters. The country was founded by, and is primarily populated by Bee Fae. They call the very center of the country home, in a large Hive, where they live and work until the Season of Death Mist. The country is governed by the Bee Queen, even humans answer to her whims, although she is lax with many laws for races not Bee Faeries. The primary export of this country is, of course honey, as well as flowers. A large flower field surrounds the Hive, and is guarded fiercely by Drone Bees. To the north Hivae is bordered by the Frozen North. To the west, Paradise. To the southeast, Hearnel. On the east side is the sea, most of Hivae's cost being made up of an inlet called the Bay of Restoration. Monument, Kail and Chastity's hometown, is visually based off of Olden, Norway. Most of the human inhabitants of Hivae draw cultural aspects from Norway, Sweden, the Welsh, and the Ukraine. There are little to no beast folk found in Hivae, due in part to the Bee Queen not wanting them in her realm. Monument-a village found at the foothills of the mountains on Hivaes northwest side. It is largely cut off from the rest of the country due to the mountains and Vrch Lake, which it sits upon. The village is largely human-populated, but will trade with the Avian beast folk and Avian elves. Visually the town is modeled after Olden, Norway. 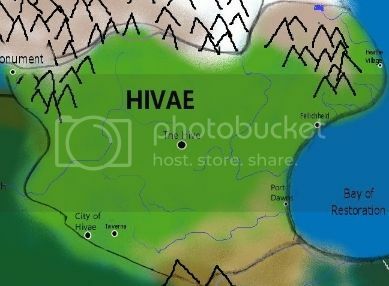 The Hive- The Bee Fae's primary home and capitol of Hivae, located at the center of the country. This city is primarily Bee Fae, although other races are allowed to live in the Hive on very rare occasion. While the Bee Queen is usually benevolent towards all, she does not want other races to distract the workers and drones, or destroy her gardens. One must prove they have something to benefit the Hive before the Queen will allow them to live there. The Hive is surrounded by a vast flower field, where hundreds upon thousands of exotic flowers grow. City of Hivae- The "human" capitol city. Located on the border of the country of Hivae and the country of Paradise. It is a trading hub, and the second largest city in Hivae. It is considered advanced compared to the other settlements in Hivae, mostly due to it being a melting pot of many races and species. When on their 'seasonal' break, most Bee Fae congregate to the City of Hivae and its suburbs. The City has some of the best education available outside of the Pantheon, and some of the prettiest architecture as well. Taverna- a town in the suburbs of the City of Hivae. As the name suggests, it is mostly filled with taverns, but is a popular place to shop as well. It borders a pleasure district. Port Dawns- The "sister" city to the City of Hivae, where much of it's trade comes in from the Frozen North. Although not as large as the City of Hivae, it is almost as diverse. Feilichheid- A small town, mostly populated by Elves. Heathe Village- A fishing village. Tiny in size, but has a well-maintained dock for larger ships. A popular place for ships going to and from Port Dawns to stop at, mostly for it's surprisingly exotic brothel.